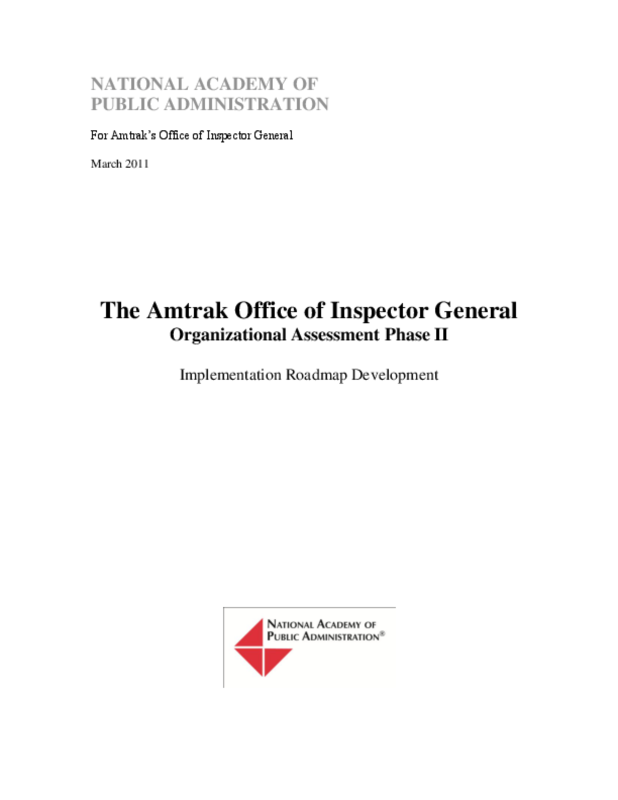 In the spring of 2010, the Academy conducted an independent organizational assessment of the Amtrak OIG. The Phase I final report addressed eight critical areas of focus, and for each of the these focus areas, the Academy identified a desired future state, key observations, critical risks, "quick win" opportunities, and long-term recommendations. The Phase I results formed the basis for the Phase II of the organizational assessment. The OIG assembled Working Groups for each of the focus areas, and the Working Groups engaged in 24 thought-provoking discussions facilitated by the Academy's Study Team to develop Implementation Roadmaps. Each Implementation Roadmap consisted of a 12-18 month tactical plan to guide in the accomplishment of the most critical improvements identified in the organizational assessment and provided the information needed for OIG leadership to hold staff accountable for progress on key activites and milestones of the priority issues. In addition to yielding the Implementation Roadmaps, the Working Group sessions had broader impacts on the OIG-wide organization, including building a participative management approach, engaging and empowering staff members, and instituting a sustainable process to improve the organization's operations. Copyright 2011 National Academy of Public Administration.